Maximum user weight 115kg (18st 1lb). The MMRC1 has a robust steel frame with an 8 setting magnetic resistance system, large padded reach adjustable seat and backrest, padded handlebars and oversize self-presenting pedals with adjustable toe straps and a large single screen LCD exercise monitor with theoretical calorie burn, distance, handgrip pulse, programme, speed & times modes. Stylish, modern, robust and fully functional manually adjustable magnetically resisted recumbent style cycle. Magnetic resistance system. Hand grip pulse sensor. Console feedback including: calorie (theoretical calorie burn), distance (miles / km), handgrip pulse (beats / minute), programme, speed (mph / kmh), and time (minutes and seconds) modes. 8 level tension control. 3kg flywheel. Self levelling pedals with pedal straps. 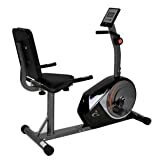 Posts related to V-fit CY090 Manual Magnetic Recumbent Exercise Bike.